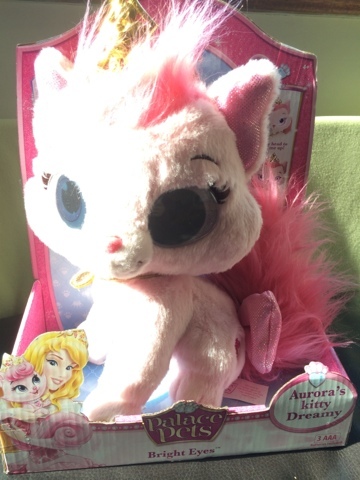 My daughter, Maegan is 4 so she's really into Disney Princess Palace Pets at the moment, she hasn't got a favourite yet - she seems to love all of them, however she does like Sleeping Beauty (Princess Aurora) a lot so Dreamy is Maegan's pet! 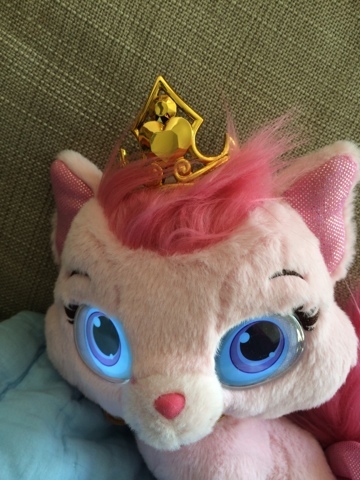 We love the Disney Princess Palace Pet Bright Eyes collection, and wanted to share with you Dreamy (aka Beauty) she's a beautiful pink royal kitten who belongs to Princess Aurora (Sleeping Beauty). 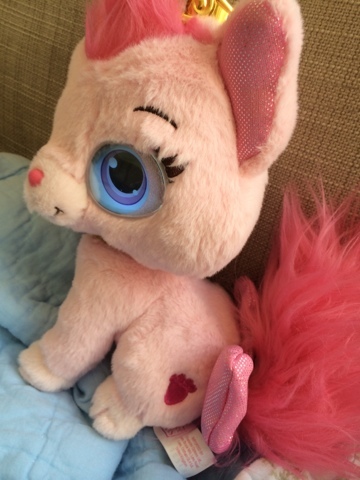 The Bright Eyes plush has special eyes which light up in the dark, but they are also lit with expression so you can see when your cat is awake, asleep or even blinking. You can pat Bright Eyes Palace Pet on the back to make her sleepy, or on her head to wake her up and she's programmed with 20 Palace Pets phrases to say, she talks a lot about seeing you in her dreams and feeling sleepy! 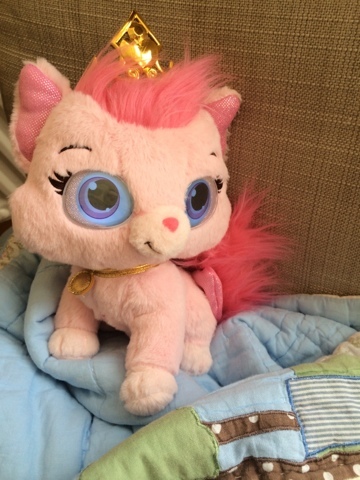 Her pink hair and tail are styled like Princess Aurora's hair and Dreamy wears a golden tiara and gold collar. She has a pink beauty spot and a large bow on her tail. She runs on 3xAAA batteries (included) and has a mute button as well as an on/off switch! Dreamy is very cuddly and Maegan thinks she is beautiful - absolutely adores her! Available from Character and Argos. 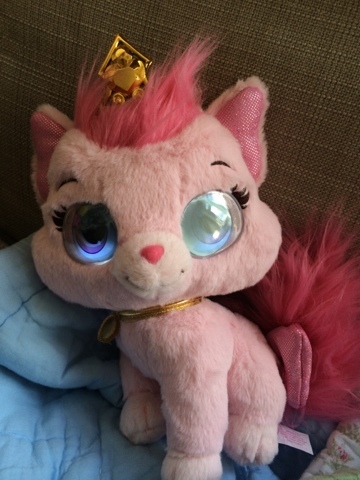 I received Bright Eyes Palace Pet for the purpose of this review - all thoughts, words, link choices and photos are my own.